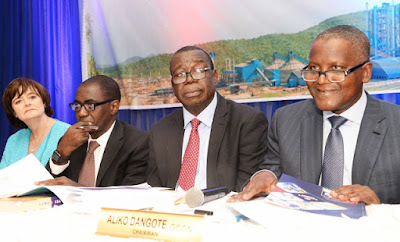 Shareholders of Dangote Cement on Wednesday at the company’s 9th Annual General Meeting (AGM), held in Lagos were full of praise for the Board, Management and staff of the company after approving the dividend payout of N10.50 per 50k share, representing 90 per cent of net profit and an increase of 23.5 per cent on the N8.5 per share paid last year. The shareholders described Dangote Cement as a very reliable company that has consistently demonstrated its love for the shareholders. They unanimously urged the regulators to give a special award to Dangote Cement and its Management for keeping faith with the shareholders. President of Progressives Shareholders Association of Nigeria, Boniface Okezie, said the shareholders were pleased with Aliko Dangote and his team. He said for the company to still pay a robust dividend despite the recession in the economy, which also affected their operations shows the doggedness and the fighting entrepreneurial spirit of the Management. Dr. Umar Farouk, another shareholders’ association leader urged the regulators to adequately compensate the Management of the Dangote Cement with an award as it has consistently kept faith with its shareholders. 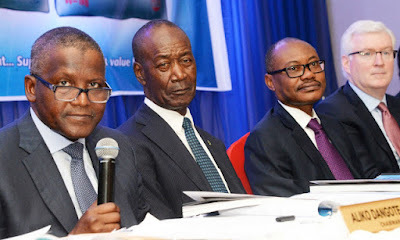 Chairman of Dangote Cement, Aliko Dangote, however, attributed the 31 percent increase in the company’s revenue of N805.6 billion to its pan African operations growth which also recorded a significant increase in revenue from N195 billion to N258.4 billion in 2017.